Many composers are asked to write music for special occasions, and various countries hosting the Olympic Games have commissioned music from composers such as John Williams for example. 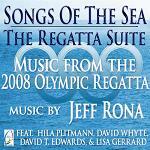 This particular album called "Songs of the Sea: The Regatta Suite" is based on the music which Jeff Rona was commissioned to compose for the 2008 Olympics in China. It was premiered at the Olympic Village in Qingdao and then in various Chinese cities including Beijing, Shanghai and Hong Kong. The music is warm, majestic and suitably heroic with elements of striving against the odds, and clearly influenced in places by other examples of heroic music composed for other celebratory events and previous Olympics Games. However this is not wall to wall bombast. The album is nicely balanced by a number of lyrical and impressionistic tracks. When listening to it, it easy easy to imagine yachts gliding across the ocean. "Calling of the Sea" begins with a Fanfare which introduces the main theme. There follows a contrasting middle section on strings which seems to recall the romance of great sea-faring voyages, before the brass and drums re-enter to conclude the track in heroic fashion. "The Noble" is well-named, and could be seen as depicting the constant struggle of the human race to tame and conquer the elements. "Song for the Salmon" is a complete change of pace, with the music providing an evocative backdrop to text by poet David Whyte. The subject and style of this track and the following energetic "Great Journey" perhaps suggesting nature programmes like "The Blue Planet" and the music of composer George Fenton. "On the Open Sea" is a lyrical track with lots of ocean swells, and "Reflections for Oboe and Strings" is very much the emotional heart of the album - quietly contemplative and quite classical in feeling, and inviting comparison with Morricone's "Gabriel's Oboe". "Intrepid" introduces another change of pace as a robust march follows after a brief introduction. Frank Ge-Fang Yang provides the impressionistic solo part in "Fantasy for Violin and Orchestra". Parts of this track sound very much like a Chinese version of Vaughan-Williams' The Lark Ascending while brief sections flicker with a suggestion of a Prokofiev cadenza. "Horizon" has a hymn-like quality and feels like a finale when it comes to a very definite end, making "Wisdom of Wind" feel like an epilogue. This final song is sung by the soprano Hila Plitmann. There is a co-composer credit for David T. Edwards on tracks 4, 5 and 9, and Lisa Gerrard is also mentioned on the cover - though it is not clear from the credits what part she played in the album. Nevertheless Jeff Rona's talents are at the core of this album and his majestic music is a great addition to the wealth of artistic works inspired by the sea. It is available for online download from this link at Amazon.com and also from iTunes - see the news section of Jeff Rona's website.